French Emblems: Emblem: Fortunae instabilitas. Slippery fortune can’t stand still in one place, she’s skilled in seeking out new places to rest. Hence the city of Smyrna set up a statue of the Goddess with maimed feet and relying on a feather as her oarsman. sculpsit, ut vagam nullique perpetuò addictam. ita porrigens, ut pennas suas comprehendi non sinat. A heroic hexameter precedes an Archilochian dactylic dimeter hypercatalectic, in the manner of the ode of Horace: “The snows have melted: now grass returns to the fields, and leaves to the trees”. Of all the Gods, none had such prodigality of inventiveness by the ancients as Fortune, as she was believed to fill both sides of mortals’ account-books. Hence she had so many epithets, of which others have spoken, so many portrayals, so many different representations. 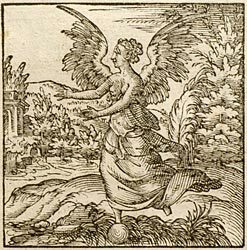 In Artemidorus (On Dreams, book two), she is standing on a smooth Cylinder; in Pausanias (Description of Messenia) she is balancing a pole on her head; in the same author she is carrying a Cornucopia, and accompanied by a winged Cupid; in Cebes and Eusebius she is winged, and sits on a pillar [or a ball*]; in Lactantius (bk. 3) she carries a Cornucopia with a ship’s rudder; in Plutarch, she is smeared with bird-lime. Just as Fortune is an ally of variety [i.e. unpredictability], even so is she portrayed in a variety of ways. In Smyrna, the very famous city of Asia [Minor], they portrayed her in sculpture as lacking feet, as a symbol of her instability: which is the origin of Apelles’ jest about Fortune, when he said that she had been sculpted by him sitting for another reason, that is that she never stood still. But in Smyrna she was portrayed as winged, as she is given to wandering endlessly, in no fixed direction. [p.114] And so she should be depicted without feet, and holding her hand stretched out so as to stop anyone from grabbing her by the wings. * pila can mean either a pillar or a ball. 2. i.e. she dealt out both good and bad fortune. The metaphor or proverb is found in Pliny, Natural History, 2.7.5.22: ‘fortuna paginam utramque facit’; and is also used (with ref. to Fortune) by Coustau, Pegma, emblem 53 ([FCPb053]).